Migrating from Lotus Notes and Domino to Office 365: how to overcome the “apps” issue. Migrating from Lotus Notes and Domino to Office 365: How to Overcome the "Apps" Issue. The reasons to move away from Lotus/IBM Notes and Domino should be pretty obvious for everyone by now: it is a closed platform, where interoperability with other data was not really the first thing in mind back in the times when it was created, data and application management is suboptimal, but, the foremost, it is a really old platform, which is not being actively developed anymore. And Notes/Domino experts are really difficult to find. The truth is, nowadays cloud platforms can perform all the tasks that were previously done by Notes/Domino platform on way easier, cheaper and more manageable way. Plus, you get the things on top, such as Skype for Business for communication and telephony, Teams for collaboration, etc. There are good and proven tools to migrate mailboxes and data from Lotus Notes/Domino to Office 365. So, the question here is: what is stopping you? The question might be triggering and complex, but the answer is easy: probably the apps. There are dozens of thousands of business solutions built on top of Notes databases, which are built on top of Notes/Domino databases. Let us, for the sake of being “modern”, call them apps. Those apps on top of Lotus Notes/Domino platform were supporting different processes, they had user interface, they had reporting, they were good friend to both professional developers and citizen developers on top of it. And no, there is no automated way to migrate these applications to anything else automatically. Plus, SharePoint, with its default features, does not give you any rapid app development capabilities the way that Notes and Domino did. The picture above shows the various stages of a successful Lotus Notes/Domino databases to SharePoint Migration. 1. Analyze – you will probably not want to migrate all your databases and applications. Very often organizations don’t even know which Lotus Notes databases are present in the environment. Luckily, there are discovery tools which can help you discover and catalogize all the databases, and to get important information about their usage. AvePoint, for example, offers a free tool which will do the assessment of Lotus Notes environment, and create such a database catalog. So this step can be fully automated. 2. Decide – once when you create the database and application catalog, you need to decide what to do with those databases. Some are archaic, not needed anymore, and can be ignored. Some are not used anymore, but their data is still relevant, they should be archived. And some are still very actively used. They should be moved to the target platform, in this case, Office 365 SharePoint Online. This is a manual work, where you will need to involve all interested parties. 3. Migrate Data – for those databases which need to be archived, or are still actively used, you will need to migrate their data. Luckily, there is lot of tools available on market today which can do this very well. AvePoint’s DocAve migrator shows particularly good results. You can create mappings between Lotus Notes databases and fields and SharePoint sites and Lists and Libraries, and fully fine-tune your data migration. 4. 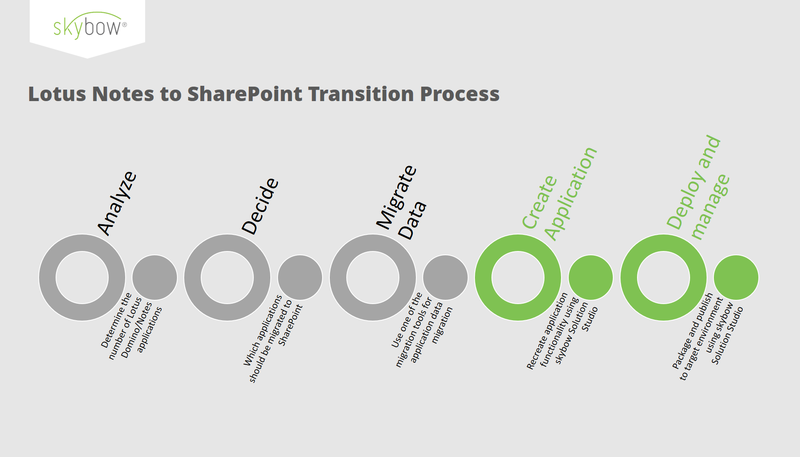 Create Application – you will need to recreate that you will want to further on use in the target environment (SharePoint Online). There are multiple options how to do this, which will be discussed in the next chapter, but skybow Solution Studio is the best way forward with this. 5. As with each other piece of software, Lotus Notes applications, which are now SharePoint Applications, needs to be managed: new requirements and changes will be coming, you will need to manage updates and deployments. While due to the Lotus Notes nature this was a non-issue in that system, it is very important in the new shiny world of cloud applications. And skybow Solution Studio is still the best way to do it. 1. Look if there is an existing cloud service which can cover your needs. You had a custom expenses management in Lotus Notes? Well there are many SaaS (Software as a Service) available today on the market. They might not fit your needs to 100%, but they will cover the famous 80%. The problem with this approach is the existing data: it is usually impossible to move existing data to a public cloud offering. 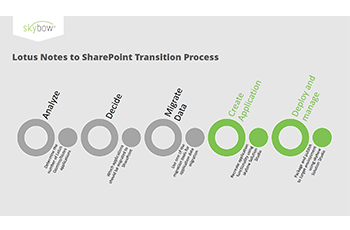 And, you have probably migrated that data already into SharePoint in the previous step. 3. 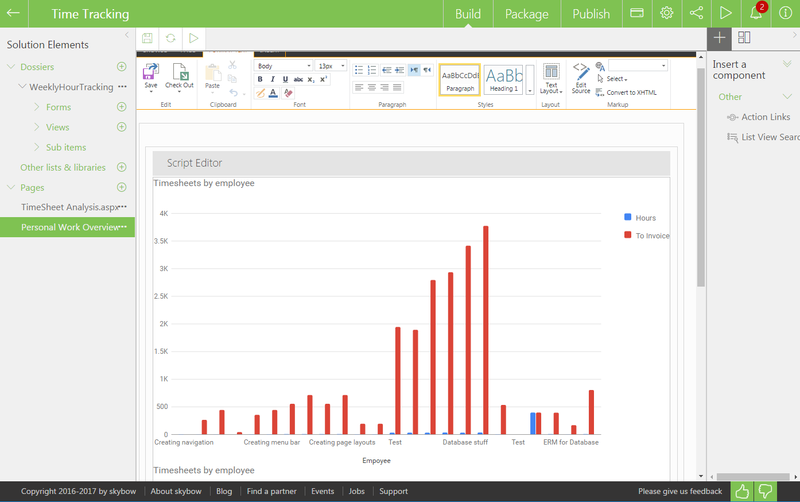 Redevelop the application directly on the SharePoint. 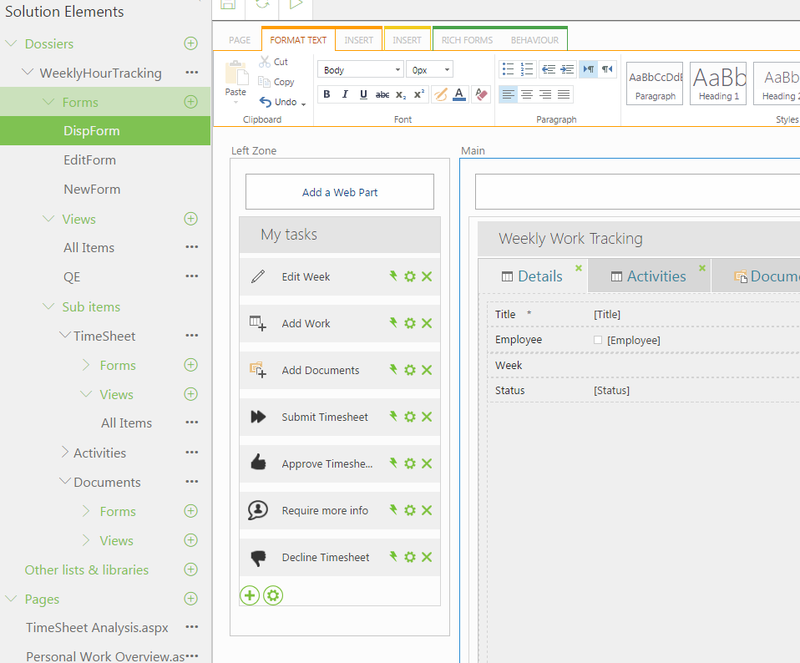 SharePoint has all the APIs and hooks needed to do this, and the new development framework, the SPFx is actually brilliant. But, you are guessing already: this is a hard development work, and (good) SharePoint developers are not cheap. SharePoint Online does not have rapid development, building-blocks-like features to put your application together, the way that Lotus Notes had. And this is where skybow Solution Studio fits into the story. It is the world leading platform for rapid development of business solutions on top of SharePoint Online and SharePoint Server. Just has you are used from Lotus Notes: you can put your data models together, create user interfaces, define processes which can be triggered manually by users or automatically in the background, and create stunning reports and dashboards from your data. That way, transition from legacy Lotus Notes applications to modern, SharePoint-based solutions is seamless and easy. Solution builders – citizen and professional developers alike (to the different degree of detail) can easily create data models using dossiers. An example of such as data model is represented in the screenshot below. This way, it is easy to create advanced data models and master-detail relations, based solely on SharePoint’s built in features such as lookup fields. And yes, we do support cross-site lookups fields. On the screenshot above, we also see a modern, intuitive navigation built with skybow Solution Studio’s feature called Action Links. Navigation is unified, and both page navigation and process steps are part of the same, seamless navigation experience, making the user interface easier to understand and operate. 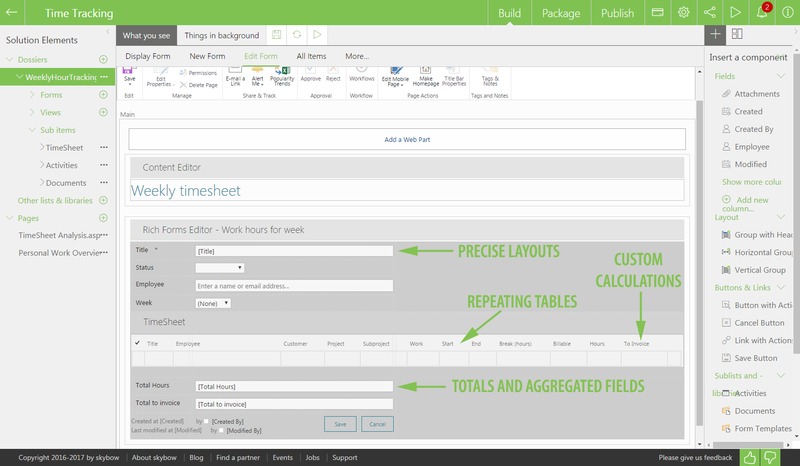 Powerful skybow UI designer and process editor supports creating rich master-detail views and forms, calculations of all kinds directly on the form fields, ad developing processes triggered by the user or running in the background. 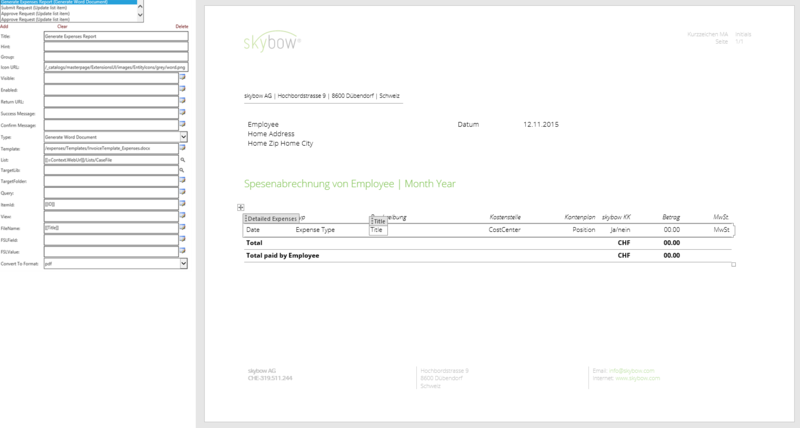 Last but not the least, with skybow Solution Studio, you can generate documents (reports) with custom design using nothing by Microsoft Word, and integrate dashboards of any kind. 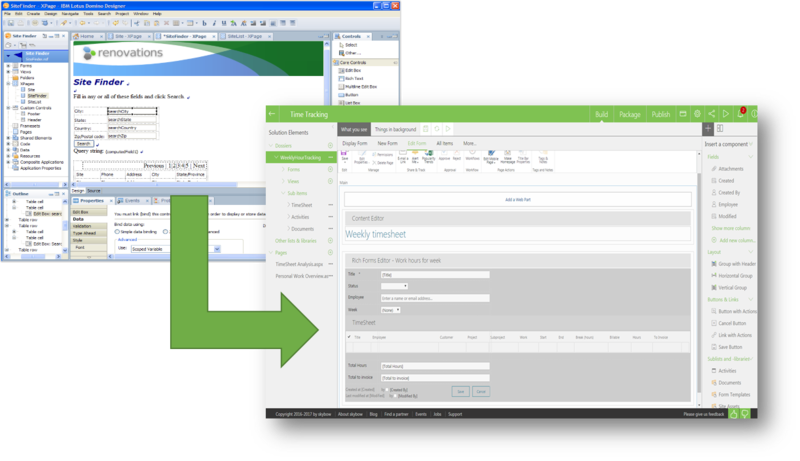 From all these reasons, and from 1:1 feature parity with Lotus Notes solution design interface, skybow Solution Studio on top of SharePoint Online / Office 365, is the most easy way of migrating Lotus Notes applications to SharePoint.